– the future of a better impregnation has already begun with us. Where to use Water and oil stay on the surface and can therefore easily be removed. EBIPHOB TX binds nano siliicone particles to the fibre which allow the hydrophobic effect and also the oleophobic effect that was not possible until now without using fluorine. EBIPHOB TX can be applied on all textile surfaces such as apparel fabric, clothes, blinds, tents, upholsteries, carpets, folding tops on cars, functional garment, umbrellas and textiles for outdoor use in general. It´s also suitable for every type of natural fibre like wool, cotton, sisal, coco, linen, viscose etc. Application Net completely in the washing drum or in case of panels soak in the foulard. Fix the textiles in the drum (or in the tenter if a tunnel oven is used) if the temperature is between 100 and 140 degrees celsius. If applied on small surfaces, spray by using a depressurised and refillable aerosol can. Then fix the textiles with an infrared heating element or with a dryer. If no industrial washing permanence is required, drying at room temperature is sufficient. The final result is acheived 72 hours after application. Status quo All well-known producers try to replace the results gained by fluorine by using alternative solutions. This often means the name is changed but fluorine is still used or weaker solutions such as paraffin or silicones are in use as replacement. 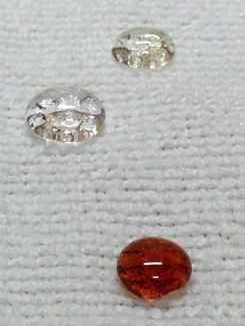 To gain a hydrophobic effect, paraffin is used since 1830 and silicone since 1940 which represents no new protection technology. The abandonment of PFOS (perfluoroctane sulfonate) is underlined particularly – the use of this ingredient is only allowed in a very restrictive way since 2008 and by 2015, PFOS should have been completely disappeared from the market. Greenpeace and other environment organisations have this issue on their agenda.Authorities such as the Environmental Protection Agency (EPA) in the United States are doing research on the sources of fluorine pollution since years - this does not only concern the environment but also human´s bloodstream. Somehow, producers of impregnations did not manage to establish a new solution (or they could not do so until now) and therefore try to disguise the use of fluorine by using a wording like “according to the data we have at present, there is no reason given for consumers to avoid industrial or consumer products based on perflourinated compounds“. The solution is now namend C8- or C6-fluorine chemistry pretending to be PFOA- and PFOS-free but instead, other ingredients such as PFHxA (Perfluorohexanoicacid) with a more “convenient“ ecological profile are used. At the same time, unclear names such as “Telomere“ are used to state the abandonment of fluorine. In fact, it is always the same ingredient, every type of fluorine is a risk and problematic if getting in contact with the environment by wastewater or by dumps – and there is no control. EBIPHOB TX is completely free of fluorine additives providing the same results like fluorine impregnations. The future of a better impregnation has already begun with us. EBIPHOB TX does not contain any fluorinated silicones, acrylates or paraffin (see “status quo“), it is ready for industrial use and is effective immediately after application. 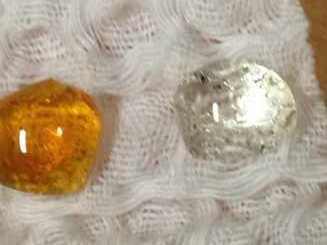 Unbound and visible residues, spots or films do not occur. In the sense of ecology, EBIPHOB TX is completely free of fluorine and dendrimeres as well as of C6 or C8 – they can cause unwanted reactions to the environment if they are dissolved. Blend EBIPHOB TX does not have to be blended, it comes ready for use in a spray bottle. How to use EBIPHOB TX is applied by spraying. For smaller surfaces, a depressurised aerosol can is used, for larger surfaces, use HVPL or conventional paint sprayers. Drying is done at room temperature or in the hot-air-duct. For a proper industrial application, we need samples in order to provide a recommendation for application. 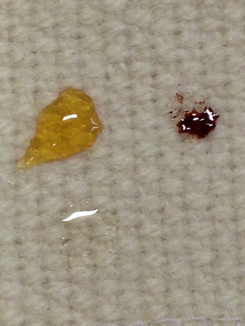 This sample was impregnated with EBIPHOB TX textile protection like the other samples. 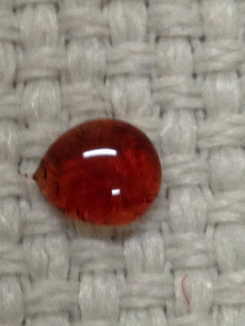 View of the sample after the application of oil and wine – dried for 24 hours. Neither oil nor wine have entered the material. Even very finespun textiles can be protected perfectly. With the right spot removal this drop of red wine can easily be removed entirely, just use an absorptive type of paper, that´s it.